This was for the next day’s filming by the crew from RTM2 programme, #OBB, short-form for #Orang Baik-Baik. Dr. Ng had briefed me that producer, Nik Jassmin Hew and her crew will be in Johor Bahru to film the activities of their kitchen waste recycling project in the partnership of Renaissance Johor Bahru with FOLO Farms for the #OBB television series. Produced by Serangkai Filem and Moro Films, the target audience for #OBB is teenagers with its message to spread love and kindness and to show that anyone can take up a cause and serve the community. FOLO, short-form for Feed Our Loved Ones, is a social enterprise that started in early 2015 by a group of urban farmers made up of Dr. Ng, Will Chua, Gerald Ling, Jason Lim and Tang Thian Yeong, better known as TY, farmer Lek Meow Chor, and their families. Their goal was to reclaim ownership of the food they ate and to feed their loved ones with healthier choices of vegetables that should ultimately result in better health. The song, Orang Baik Baik, loosely translated as, People Doing Good, was written by Art Fazil and performed by Art Fazil and Imuda, and produced by Moro Records, the record label run by Jassmin. In 2016 when Jassmin visited FOLO Farms with NGO representatives who championed different causes, she was so inspired by the amazing Orang Baik Baik around her that the idea for this series was born. These inspirational people were contributing so much to the community and this compelled Jassmin to pitch her idea to national television station RTM2, for a series of shows that feature people who are doing something good in the various states throughout the nation. In Johor, she wanted to feature the FOLO farmers. So after making detailed plans, she and her crew set out on a road trip around the country for filming. When a date was fixed for JB, Dr. Ng invited me to join them for the shoot, starting with the bin collection at the rear of the Renaissance Johor Bahru. So there I was in the loading bay at 8.45am, to join the crew while they filmed the arrival of the truck from FOLO Farms to collect the bins of kitchen waste from the hotel. After I met with Jassmin, I was introduced to the show host, Fimie Don. In the first sector, Fimie joined the driver and TY to ride in the truck’s cabin and arrived at the loading bay for the collection of the bins, just as the truck does in a daily routine. The cameras rolled as Fimie went into the kitchen to meet the hotel chef and his culinary team who play an instrumental role in helping to separate kitchen waste in the respective bins. 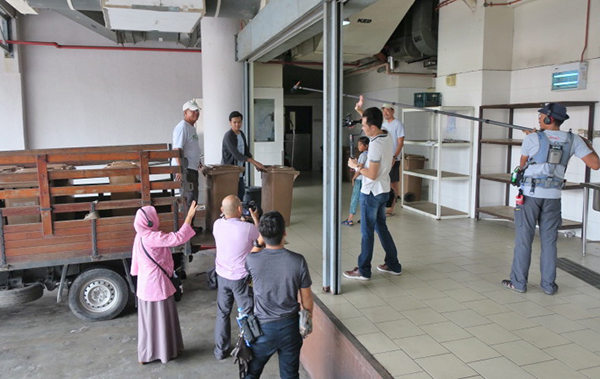 Besides observing the kitchen activities, the chef also brought Fimie and the film crew into the BLD Café to show how the wait-staff would clear tables after buffets and place General Waste and Food Waste into separate counter bins. These waste items would then be added into the large bins that would be removed to FOLO Farms on a daily basis. While all this was happening, I was careful to keep out of the way of the cameramen, lighting gaffer, sound men and boom operator, as I watched the action from a safe distance. Hotel General Manager Gaggan Singh, popped by and I guessed he was not surprised to see me there because under Portraits in my book, My Johor Stories 2: Interesting Places and Inspirational People, I had featured the inspiring work of the FOLO farmers which is making a difference in the community. The filming continued with Fimie helping to load the large bins onto the truck and once the bins were secured, he hopped into the cabin with the driver and TY and headed to the farm in Ban Foo. Jassmin and her crew stored their equipment and in separate vehicles, we made our way to the farm and joined the FOLO farmers for the next sector of the filming. The weather was bright and sunny as the filming continued with the focus on the unloading of the bins and the farmers taking Fimie on a tour of the various stages of composting. Meanwhile the farm’s packing team had arranged a range of fresh vegetables, ready to be filmed while they were being packed into boxes for the weekly distribution to the farm’s registered members. 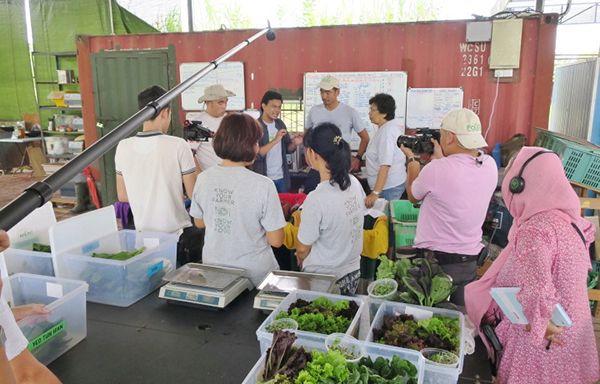 The packing team, mainly made up of the farmers’ family members, had fun as they challenged Fimie to follow their lead to pack a box of vegetables and arrange them so beautifully that it resembled ikebana, the art of Japanese flower arrangement! Dr. Ng had invited some farm members for the filming and they waited along with me, for our turn in front of the cameras. A member introduced himself as Todd, his wife, Rachelle, and her brother and his wife, who were visiting from the US. “I’m Peggy,” I responded and Todd paused a moment before he tried to hazard a guess. Todd and his wife are farm members and when Dr. Ng introduced them to my book that featured the FOLO Farms, they had ordered several copies. I had the pleasure to autograph the books for them there. Finally, Jassmin wanted an outdoor shot of Dr. Ng introducing me and my book to Fimie and for me to say a few words about the FOLO Farms. Dr. Ng told Fimie about how the farmers faced many challenges and I was deeply humbled to hear that when the going was tough, the interest generated by my stories on the farm, lifted their spirits and spurred them on to continue pursuing their goals. This #OBB television series on RTM2 is scheduled for mid-2019. Next articleAn Immersive 4D Cat-and-Mouse Chase and SEA LIFE at LEGOLAND Malaysia Resort!